Within a matter of hours, hurricanes (also known as typhoons or tropical cyclones) can reduce a country to ruins; the massive, spinning storms whipping up heavy rains and strong winds. People in tropical coastal regions are particularly vulnerable to this deadly weather combination as huge waves, floods and tornados can batter the land. The destructive storms can kill thousands and leave many more homeless. On top of the short-term devastation, hurricanes often lead to long-lasting emergencies. Extensive inland flooding can wipe out a region’s infrastructure, including transport, sanitation and health structures. When this happens, Médecins Sans Frontières/Doctors Without Borders (MSF) is ready to save lives, providing emergency healthcare, clean water and sanitation where it is needed most. A hurricane is a rapidly-rotating storm system that produces heavy rains and very strong winds. Like engines, they require warm, moist air as fuel, so the first ingredient needed for a hurricane is warm ocean water. This is why hurricanes form only in tropical regions where the ocean is at least 26 degrees Centigrade for at least 50 meters below the surface. The second ingredient for a hurricane is wind. As the wind passes over the ocean’s surface, water evaporates and rises. As it rises, the water vapour cools, and condenses back into large water droplets, forming large cumulonimbus clouds. When wind speeds reach 119 kph, tropical storms officially become hurricanes. They are at least 1,500 metres high and around 200 kilometres across. The eye is around eight to 50 kilometres wide. Hurricanes usually weaken when they hit land because they are no longer fed by the energy from the warm ocean waters. But, they are still capable of generating high waves, destructive storm surges and devastating tornadoes which can travel further inland. Hurricanes are also known as tropical cyclones, typhoons or, simply, cyclones. 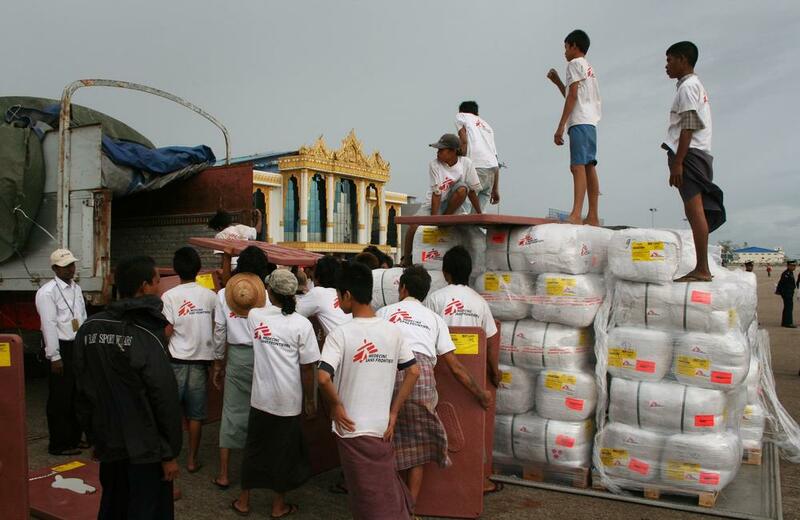 MSF has a long history of responding to these deadly natural disasters. Over 11,000 people were killed and roughly 2.7 million left homeless by Hurricane Mitch, the most powerful tropical storm of the 1998 Atlantic hurricane season. 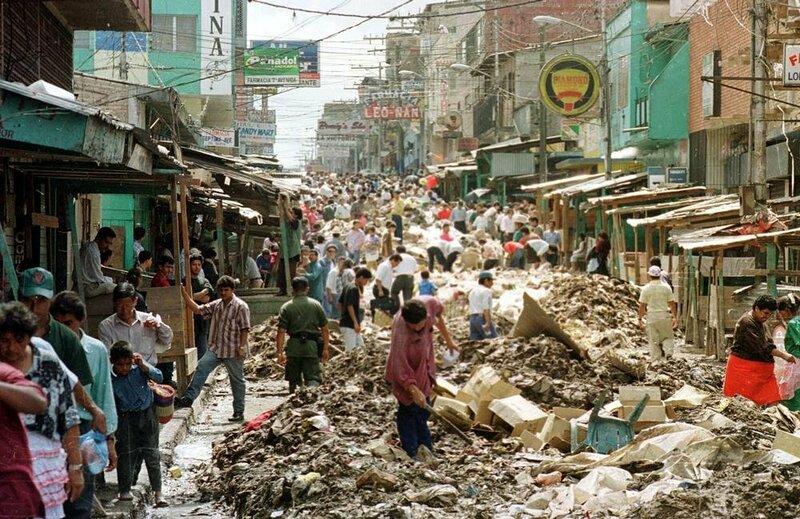 Due to its slow movement, Hurricane Mitch dropped historic amounts of rainfall in Honduras, Guatemala, and Nicaragua, with reports of up to nearly two metres. From the onset of the disaster, we delivered medical care and relief supplies to the most affected regions of Honduras, Nicaragua, Guatemala, and El Salvador. Epidemiological and nutritional surveys were done regularly in certain hard-hit regions to monitor health and food needs. In Choluteca and Tegucigalpa in Honduras, our teams repaired water and sanitation systems damaged by the flooding, and distributed water chlorination kits. “For me the main problem is not today. The main problem will be in two or three months. Right now they're receiving quite a lot of help and food. There's a lot of solidarity. But in one month, no one will remember Guatemala,” said Oscar Bernal, a nutritionist and public health professional in Guatemala City. On 2nd May 2008, cyclone Nargis struck Myanmar, killing an estimated 138,000 people across the country. Immediately after the cyclone hit, our teams in Myanmar began assessing the needs of the population. In response to the crisis, we added water and sanitation experts to our already 250 strong team in the area. According to Michel Becks, an MSF emergency water and sanitation specialist: “In Myanmar, there is water everywhere but no safe sanitation. Cargo plane being unloaded in Yangon airport. The Nargis cyclone, affecting several areas of Myanmar, caused the death of several thousand people and brought about severe physical damage. Hurricane Sandy was the deadliest and most destructive hurricane of the 2012 Atlantic hurricane season. Sandy developed from a tropical wave in the western Caribbean Sea. Within a week it had hit several countries including the United States, where it landed on New Jersey as a post-tropical cyclone with hurricane-force winds. We mobilised local medical and mental health teams to meet some of the humanitarian needs of those affected by Hurricane Sandy in New York. We visited several emergency shelters for the displaced, working to support the onsite medical team. We mobilised additional support for exhausted and overstretched medical workers and volunteers in Manhattan and Brooklyn. We did not seek any donations to support these efforts. Approximately US$35,000 raised by New York City marathon runners to support our medical programmes was used for the Hurricane Sandy relief operation. 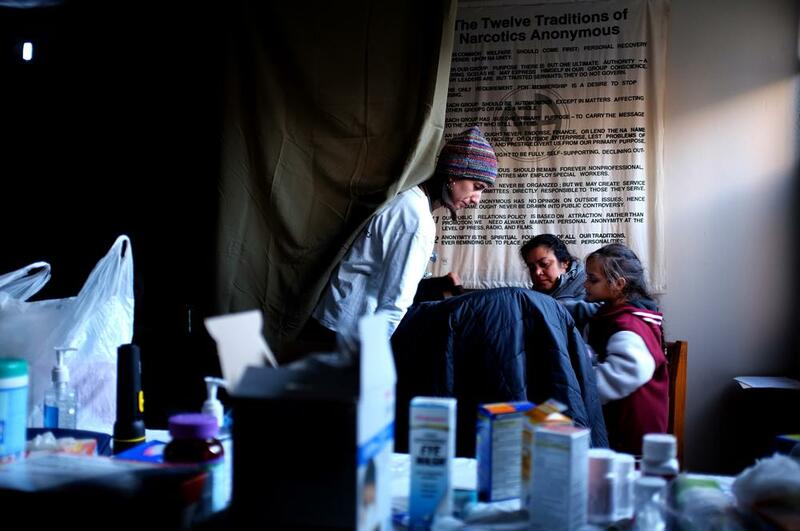 Dr. Lucy Doyle, a physician with Doctors Without Borders, examines patients in a makeshift medical clinic in a building at the Ocean Village housing complex in Rockaway, Queens, November 5, 2012. Electrical power, heat and plumbing were cut in the entire five-building complex following Superstorm Sandy. The clinic was established in a room normally used for Narcotics Anonymous meetings. 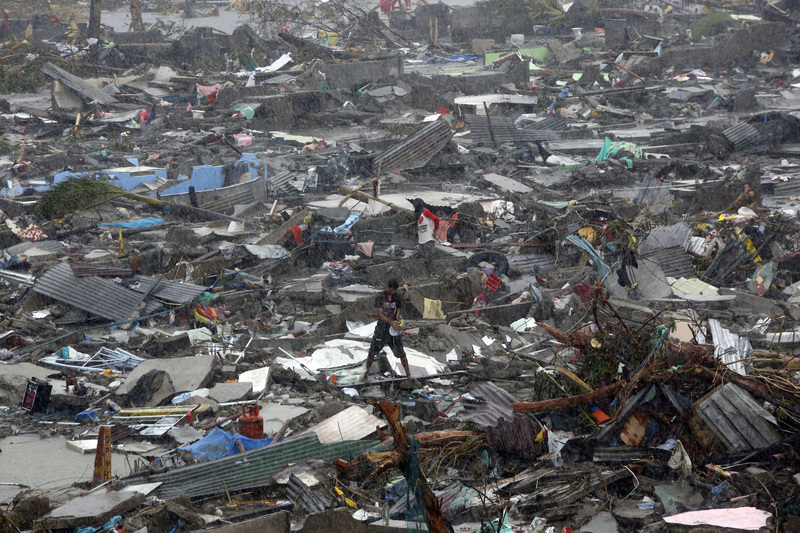 Typhoon Haiyan, or Yolanda as it is known locally, was the strongest typhoon ever recorded at landfall, ripped through the central Philippines on 8 November 2013. It caused devastation on an unprecedented scale – roofs were ripped off, villages were flattened, livelihoods were swept away and a tsunami-like storm surge claimed more than 6,300 lives and displaced some four million people. In the aftermath of the typhoon, we were able to provide emergency assistance to communities on three of the worst-affected islands: Samar, Leyte and Panay, as well as several outlying islands. This included addressing acute and immediate medical trauma needs; restoring basic medical services and facilities; providing shelter, reconstruction kits, water and sanitation facilities; and offering psychosocial support to both children and adults. Whenever a natural disaster strikes, we are ready to intervene and provide lifesaving assistance wherever the need is greatest. Hurricanes can be particularly destructive, claiming lives and causing problems in both coastal regions and areas inland.